We are Pat & Loretta Phillips who live in a small lakeside community south of Plattsmouth, Nebraska. We are passionate about our dogs and golf, thus our kennel name. 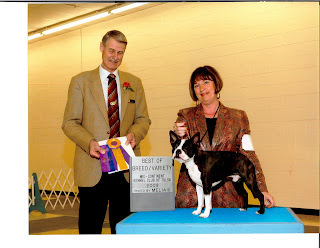 We are dedicated to the enjoyment of our Boxers and Boston Terriers and subscribe to the breed standard of the American Boxer Club and the Boston Terrier Club of America. 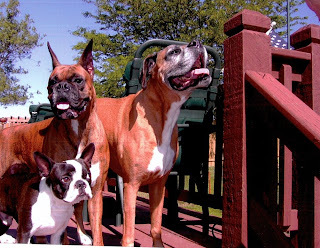 We are members of the Missouri Valley Boxer Club, the American Boxer Club, Heart of America Boxer Club, and the Hawkeye Boston Terrier Club. It was just like the good old days when gorgeous Spencer and his novice owner/handler stumbled/walked into the ring and won in spite of who was on the "other end of the lead" - thanks so much Sabrina for trusting/sharing Toby with me and giving me back the confidence that has waned the past few years . . . I really felt good taking Best Junior, Reserve W/D and Winners Dog at our hometown show at the Quest with this beautiful boy my first weekend in the ring with him! I am looking forward to showing him in Topeka and Des Moines in the next few weeks and hope we can bring home more ribbons and lots of points for Sabs and Jeff! Stay tuned . . .
At the ripe young age of 14 months, little Doodle Bug, Dupers, Doolster, Mr. Doodle, little Pookie Pie - is an AKC Champion! I had soooo much fun showing the little critter and put all but the last major on him in 8 months of showing - - - Then "the expert" stepped in at the NKC shows just to make sure he finished . . . thanks so much to my friend Lori McClain - you're the best! 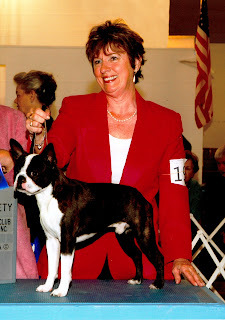 You see, there was a beautiful Boston entered that Lori had taken a Group 1 with previously -- and when she asked me if she could show Dooley I was all over that! Figured I'd better cut my chances of missing out on that last major - - - my gut feeling was right and here's our Happy Day Photo -Thanks, Lori ! ! It's on to the Breed ring for a few shows to see how he does there - he has passed all of his health testing, eye, ear and patella AND thanks to his Aunt Kathy Hulstein, we know he has lots of "swimmers" :-) The future is bright for this little star but even if it wasn't the show career of a life time making him shine, we would not love him any less if he was "just" our little lap dog. We are lucky that he loves to be both . . . It is a sad day - Rocky left last night to join Dempsey, Spencer and Prissy at the Bridge - we took him to the vet for the second time this week when his legs just wouldn't hold him up - he had torn both ACL's just from being old and weak - we just couldn't let him suffer. 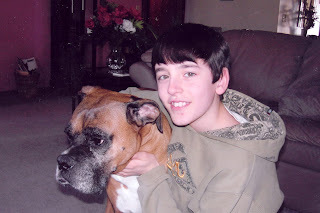 Pat said it best - Rocky spent the first year of his life tied to a car - we can't let his last year be anything but good. COULD JUST LEARN TO BARK . 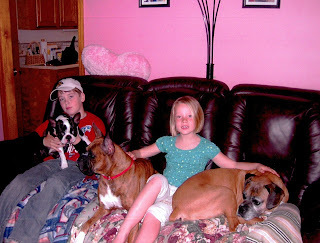 . .
Rocky was not only loved by us but all of the family too - here he is with some of his favorite grandkidhumans - how he loved the little ones - puppies and kids! We will always miss you Rocky - it will never be the same without you. We've only been waiting 3-1/2 years for this photo - we are very proud of you little Echo - your grandma and mom are watching from the bridge and cheering! You are the third generation champion for us and the second home bred champion. We can't wait for our next show dog when you warm the whelping box this winter and hopefully give us a cute little boy to play with Dooley and hopefully become Champion #5 ! Well, the show photographer got half the picture fine - but the judge looked like she just swallowed a lemon so I cropped her out of this cute picture of Mr. Doodle man. 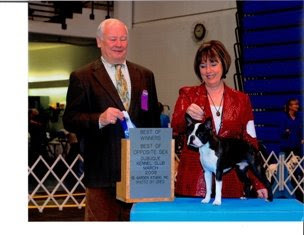 For those of you who don't know dog show talk, winning this meant he beat 4 Bostons who are already champions and one of them is in the top twenty Bostons in the United States! For him to accomplish this win was amazing and fun but you can see that for yourself in my happy mug! This win came right in behind Echo finishing her championship so I was flying high on adrenalin! Enjoy - I love my little Doodle Bug and his big sister Ch. Echo Bay's Merger of Maximus!!! 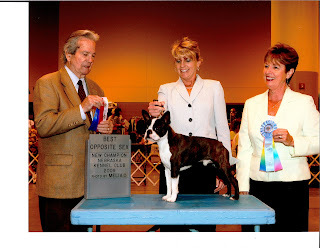 NEW CHAMPION CH. ECHO BAY'S MERGER OF MAXIMUS!! If there was ever a dog show weekend that I could call picture perfect, it was last weekend back in my sweet home state of Kansas. 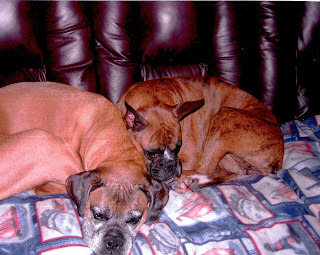 My goals were to finish Echo (Boxer), win something cute at the Boston Sweeps/Specialty with Dooley (Boston) and put a point on Itty Bitty, Echo's sister. Well, it was a clean sweep - with three Best of Breed wins and a major on Dooley thrown in for good measure! I'm still giddy on Monday and can't believe our good fortune. Right place, right time, right judge, who knows but I'm a happy camper! Anyway, I'm so proud of Echo and thankful to Lori McClain, Ashley Hamling and Savanna Hulstein for finishing Echo and though I'm sorry Lori wasn't able to be there, it was pretty sweet to be the one on the lead when the judge pointed to her!! I just can't wait till fall and the prospect of a new puppy from Echo and my 5th champion in the works . . . life is good and God has been most kind to us! 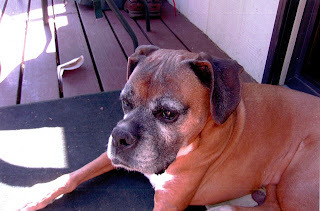 Here are a few pictures of our boxer/boston weekend - it was just a blast! I'll post the show pictures when they come of course. NO, I HAVE TO GO OUT FIRST. . . NO, I'M GOING TO PEE MY PANTS. . . NO, I'M OLDEST . . . PICK ME PLEEZE . . . A REAL BOSTON PEE PARTY??? Mother's Day took on a whole new meaning this year . . . since I couldn't be with my children, we made the weekend a 1 year birthday celebration for the Doolster! He was in a puppy match on Saturday which was his actual birthday and he got a nice present . 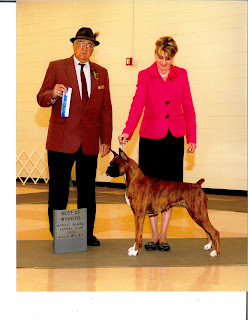 . . he won Best of Breed and Best in Match! We had a cake made with his likeness on it and Julia had such fun with him helping to celebrate his birthday. He's such a cute little guy and we hope to have him around for many, many more birthdays! Easter weekend was pretty exciting for Pat & I and our doggies - we packed everyone up including old Rocky and made the trek down to Oklahoma for the dog shows in Grove. What a nice little town with a big lake and lots of friendly people! We got rained on Friday and Sunday but Saturday was BEAUTIFUL and Echo, Rocky and Dooley actually soaked in some Oklahoma sun in the afternoon. It was probably the most "winning" weekend we've ever had since we started showing our dogs - Echo won two days straight - for her 13th and 14th points and little Dooley man got his 9th single on Sunday by going Best of Breed. Needless to say, we were pretty happy with the weekend and came home very excited! We spent quality time with Lori & Todd and as always, met new friends and dog fanciers from all over. Some of our Omaha friends were there too so it was just a fun weekend all around! Here's Dooley's picture from the Dubuque s hows a few weeks back.